Regular hygiene visits are essential to maintain good oral health. The best way to keep your teeth and gums healthy is to prevent problems from happening in the first place. At The Dental Gallery, we strongly recommend that you visit our dental hygienist on a regular basis. As well as thoroughly cleaning your teeth, our dental hygienist will offer expert advice on achieving and maintaining healthy gums and teeth. Bacteria can live in your mouth in the form of plaque, causing cavities and gingivitis or gum disease. In order to keep your mouth clean, you must practice good oral hygiene every day to remove the build-up of plaque. Good oral hygiene includes brushing your teeth twice daily, and also cleaning between your teeth with floss and an interdental brush once a day. Below, are a few tips to help you achieve the very best results. Place the toothbrush at a 45 degree angle against the gums, and move it back and forth gently in short (tooth-wide) strokes. Remember to clean the inside surfaces and the biting surfaces. Don’t forget to brush the back of the upper and lower teeth. With a good brushing technique, it will take at least 2 minutes to brush all your teeth. The interdental brush is used to clean between teeth. By turning the brush on insertion you will help to gain easier access. When used on a daily basis, an interdental brush removes plaque and food debris from areas which a normal toothbrush cannot reach. For spaces at the back of the mouth, bend the brush into a slight curve, but never at right angles, and this will help you to access the more difficult-to-reach areas. By carrying out flossing in the correct way you will remove plaque and food from places where a toothbrush cannot easily reach. These areas are under the gum line and between your teeth. Plaque build-up can lead to tooth decay, so daily flossing is highly recommended. Starting with about 45cm or 18 inches of floss, wind most of the floss around each middle finger, leaving a few centimetres of floss to work with. Holding the floss tightly between your thumb and index fingers, slide it gently up-and-down between your teeth. Gently curve the floss around the base of each tooth, making sure that you go beneath the gum line. Never snap or force the floss, as this may cut or bruise delicate gum tissue. When removing the floss, use the same back-and-forth motion to bring the floss up and away from the teeth. Superfloss is an ideal solution for cleaning braces, bridges and wide gaps between teeth. It has three unique components which work together, enhancing the cleaning process with maximum effect. 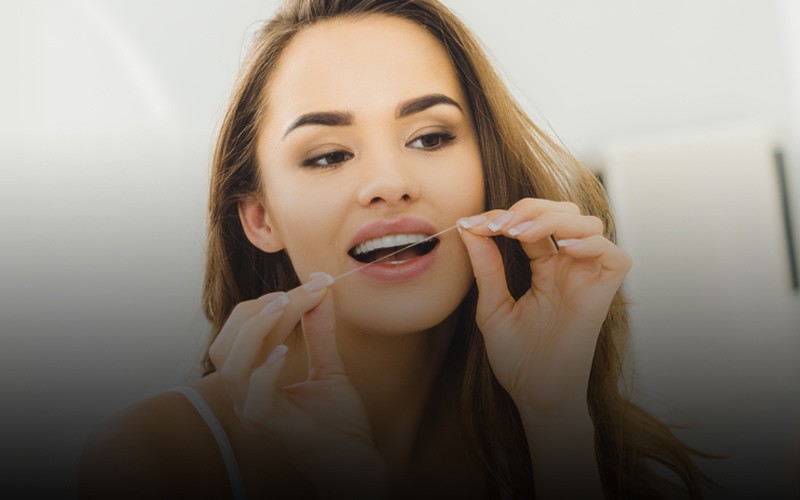 There is a stiffened end, to insert the floss between teeth and under appliances such as dental bridges and dental implants, a spongy floss to clean around braces, under bridge pontics, and in wide spaces, and a regular floss to remove plaque between teeth and under the gum line.